Also, over two thirds of group members reported that they are more likely to consider volunteering or have become a volunteer since being part of a shared reading group. It’s not surprising that reading relates to greater social activity – a 2004 study by the National Endowment for the Arts in America found that literary readers are much more likely to participate socially than those who do not read, attending arts events at a higher rate and being over two and a half times more likely to do volunteer or charity work within their communities [NEA Research Division, Reading at Risk: A Survey of Literary Reading in America (2004)]. The Reader Organisation has a volunteering programme that is fast expanding, and we currently run a range of schemes across the UK which give our readers a chance to become more involved as volunteers, spreading the joy and social benefits of shared reading even further, often to some of the most vulnerable people in society. 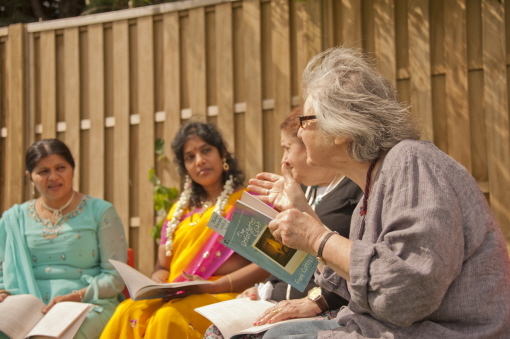 In our volunteering programmes in Merseyside and Barnet, North London, volunteers can go on to read with older people in care homes and those living with dementia, making a real and measurable difference to lives that are otherwise isolated. As part of our North Wales project, we’re building a bank of volunteers who will help us to embed a culture of shared reading across the region over the next three years. All of our volunteers receive support and training from The Reader Organisation staff and as well as benefitting the lives of others can further their own development. We’ll be sharing more about our volunteering opportunities in Barnet, as they expand to include two new projects, in the coming weeks here on The Reader Online.